← ESA RN34 Midterm Conference – join us on social media! the ESA RN34 Call for Papers for the 14th ESA Conference in Manchester (2019) has been published. Rapid, (un)expected, (un)certain and above all contradictory social changes, put identity/ies at the core of social debates, occurring at the same time at local, regional, national, European, and global levels. Defining oneself, usually by belonging to specific social groups and increasingly by not belonging to other social groups, becomes not only a difficult task, but a task which is very differently interpreted and misused by social groups, political parties, and social movements. Like other markers of identities, religion becomes a contested issue, particularly regarding its ability to play around ethnic, regional, gender, and linguistic markers. Thus, the issue of how religion, ethnicity and acculturation relate to one another is highly relevant today, intertwining with human rights, boundaries, diversity management and social cohesion. For sociology, the issue is how to conceptualize, research and understand such social processes. How important is to overcome theoretical and disciplinary barriers, to use different and innovative research methods, and to employ different lenses, such as gender, generation, or class? 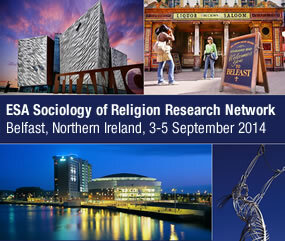 Against this background, we call for papers which make empirical, comparative and theoretical contributions to the social study of religion and its relation to identity formation, diversity management, recognition of religious rights and religious persecutions, and transnational practices, including on-line religious activities. In particular, papers should contribute to debates on:•how religion supports or undermines barriers within social groups, cities, and countries; •how religion influences social cohesion and civic and social rights;•relationships between religious conflicts, religious barriers, and social inequalities;•how increasingly diverse religious landscapes influence social and political debates. While we are particularly interested in papers that relate to European societies, we also welcome cases from other parts of the world. Graduate students are especially encouraged to apply, and we will organise a special graduate student networking session. The deadline for abstract submission is February 1st, 2019.